When Samuel Beckett took James Joyce as his role model, Joyce had completed Ulysses and was immerged in the composition of Finnegans Wake. This ‘work in progress’ had a particular structure that followed a principle discovered at the end of Ulysses. The ending of the novel introduces Molly Bloom’s last metamorphosis. She is removed from a purely human domain and brought to the level of the “posthuman”, a term used by Joyce in a letter. Molly was not only supposed to embody the Homeric Penelope but also Gaia-Tellus, the goddess of the Earth. Joyce’s life-long sponsor and supporter, Miss Weaver, had complained earlier that Molly looked “prehuman”, crude, low and unrefined. Joyce corrected her: “Your description of it also coincides with my intention – if the epithet ‘posthuman’ were added. I have rejected the usual interpretation of her as a human apparition – that aspect being better represented by Calypso, Nausikaa and Circe, to say nothing of the pseudo Homeric figures. In conception and technique I tried to depict the Earth which is prehuman and presumably posthuman”. Molly Bloom should not be understood as a real person but as a verbal construct relying on associations that are allegorical in nature. Molly’s psychology is the cumulative effect of an accretive process piling up contradictory statements. She becomes generic, universal, in the end allegorising a ‘posthuman’ Earth. This method provided a paradigm from which the young Beckett learned much. A similar wish to move beyond naturalism and psychology accounts for Beckett’s subsequent development. After several aborted ventures, Beckett realised that his own way would be to overcome the mixture of basic psychology and naturalism underpinned by the age-old humanism, in turn underpinning most novels, and that he called “anthropomorphism”. His writing would reach the inorganic essence of the Earth. By coincidence, Beckett wrote about this in a letter quoting another Molly: Molly Roe, a cousin visiting the family in 1937 for the marriage of Beckett’s brother. The family gathering proved overwhelming for Beckett, who took refuge in the painting of Jack Yeats because it suggested by contrast “the inorganism of the organic”. Beckett then stated that Yeats looked in fact “rather inhuman”, (LI, p. 546) a remark that may betray some ambivalence. The fact that these remarks date from the 1930s shows that the problematic of the posthuman cannot be attributed to the trauma of the war. 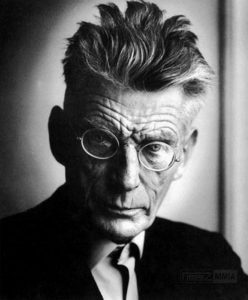 I have insisted on Beckett’s ambivalence, however, because I am wary of taking the logical next step, which would be to categorise him as a thinker and writer of the posthuman. Given Beckett’s contrarian sense of paradox, no sooner do we meet formulations that anticipate Deleuze and Guattari’s concepts than they are twisted or negated. This appears in The Unnamable, when the speaker describes his body and discovers that it has lost all trace of sexual difference: “Organs, a without, it’s easy to imagine, a god, it’s unavoidable, you imagine them, it’s easy, the worst is dulled, you doze away, an instant. Yes, God, fomenter of calm, I never believed, not a second”. God and man are here locked in an articulation that frustrates the impulse to push the speaking and desiring subject beyond the human. Then the narrator decides to stop having any pauses in his delivery; indeed, there is no paragraph break after this passage, for the narrator continues speaking uninterrupted. The syntax is less strange in French: “En voilà un qui n’est pas comme moi je ne saurai jamais ne pas être”, or literally: “Here is one who is not like me, I will never be able not to be”. Here, ‘being human’ implies both to be and not to be, as Hamlet would infer. To be human is to evade any fixed definition. We see this in Malone, presented in French as “muet, soutenant sa mâchoire”, an archaic caveman condemned to death by the very title of the previous section of the trilogy, Malone Dies, as we do in the death of God in whom artists have projected themselves since Shakespeare, Balzac, and Flaubert. Beckett’s previous characters assume the same divine stature as the godlike novelists whom he had tried to emulate, Joyce and Proust being the two masters Beckett felt obliged to reject. Philosophically, the opposition between the human and the divine calls up the basic thesis of existentialism then emerging as a dominant philosophical discourse. As Sartre explained in Being and Nothingness (1943), Being with a capital ‘B’ was on the side of pure essence, an essence often condensed by the name of God, whereas the concept of existence entailed freeing the power of negativity ascribed to human consciousness: human consciousness would keep negating both the facticity of the world and the essences of ancient gods. However, as Adorno has argued in his discussion of “Endgame”, Beckett’s proximity to existentialism is misleading. In fact, The Unnamable debunks existentialist themes by reducing them to a series of absurd equations. My aim is not to add another chapter to the competent discussions comparing Beckett with contemporary philosophy but to use this conversation as a lever in order to argue that one cannot simply enlist Beckett in the camp of the posthuman. It is tempting but quite rash to state that Beckett sits squarely on one side of the divide between the human and the posthuman in its contemporary sense. This text is partly taken from Think, Pig! Beckett at the Limit of the Human (New York: Fordham University Press, 2016), pp. 38-44. James Joyce, Letters, I, ed. Stuart Gilbert (New York: Viking, 1957), p. 180. Samuel Beckett, Letters, Volume 1, 1929-1940, ed. Georges Craig, Martha Fehsensfeld, Dan Gunn and Lois Overbeck (Cambridge: Cambridge University Press, 2009), p. 535. Hereafter LI and page number. Samuel Beckett, Three Novels: Molloy, Malone Dies, The Unnamable (New York: Grove Press, 1991), p. 305. Hereafter TN and page number. Samuel Beckett, L’Innommable (Paris: Minuit, 1953), p. 22.